Washing your windows consumes a too much time and energy? You can do something different now – simply get in touch with our representatives and request our window cleaning in Silvertown. We will manage this chore for you and the results will be perfect for all parts of your windows – the glass, framework and ledges. With our support, you will have the opportunity to do everything you desire with the time you for the most part spend for window washing. However, our services will give you even more, as you can see from our list of advantages. We also provide our professional services in nearby areas: Victoria Docks, Custom House, Canning Town, Westcombe Park, North Woolwich. You can rest assured that the great look of your business property is guaranteed. The specialists will will fulfil your need of superb commercial window cleaning. With the help of our water-fed extension pole system, you will get swift and excellent washing of all windows as high as the fourth floor. For high-rise buildings, we proceed with our rope access tools. It is our efficient technique of reaching glass panes on taller buildings. No matter what is the size of your business premise – a humble corner shop or Heron Tower – we will guarantee pristine look of your windows. You can always depend on our workmanship and commitment for private and business window cleaning. Our experience allows us to clean all types of glass surfaces you could possibly have as part of your property. For example, you can order cleaning of single or double windows, French doors, sash windows, bay windows and patio doors. In addition, we include greenhouses and skylights as part of our process. So to speak, you can fully enjoy the good look of your windows with our timely and reliable services. We use progressive techniques of window cleaning to guarantee you will enjoy the excellent end results. With the water fed pole system, high pressure cleaning and rope access equipment, you can rest assured that your property's glass surfaces will be crystal clear. Furthermore, your home is in good hands – the cleaners are absolutely insured and thoroughly trained. Our water fed poles are connected to water supply vans, while our rope access pledges for safety – even when we clean skyscraper-sized buildings. You can benefit from these techniques immediately – dial 020 3746 3113! 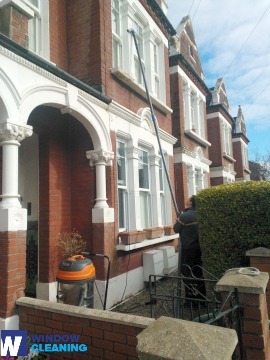 The experts of window cleaning in Silvertown will make you feel proud of your house. We deliver the best window cleaning services in Silvertown. Our procedure includes water fed extension pole system and also high-pressure cleaning. We guard your health and safety with ecologically-friendly cleaning solutions and purified water. Join our satisfied customers – dial 020 3746 3113 and get in touch with our customer care. You can also book our services online – just fill in our special form or use our chat feature.